Modern scientific theory based on the equivalence of matter and energy has led to the credible possibility of our cosmos created out of nothingness. Living cells are carbon-based with coded information in complex DNA molecules giving instruction for growth and reproduction. Such clever design, ever greater than humankind's capabilities, needs an intelligent designer. But what or who is this Universal Intelligence within our cosmos? The Bible gives the answer. Thus Paul refers to Jesus Christ when he wrote: 'For by Him all things were created.' The Apostle John wrote similarly, calling Jesus the 'Word' who was with God in the beginning. Finally what the Apostle John sees for our future is interpreted, bringing us to that mysterious wedding invitation, extended to all readers. The time left is shorter than you may think, but there is the promise of a glorious rescue on the eve of our final destruction. 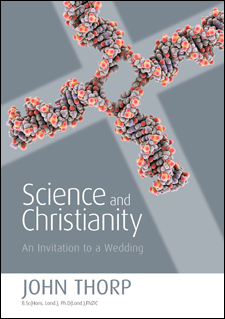 Accordingly, this far-reaching survey of time, science and the Bible, written by John Thorp B.Sc (Hons. Lond. ), Ph.D (Lond. ), FNZIC, is a 'must' for everyone. Don't get left behind. Help: To purchase the eBook version, click on either the ePUB or Kindle icon to buy from our eBook retail partners.